Redwood Terrace Supportive Housing offers its community a living environment with 24-hour onsite supervision for those in need. [i] The unique, award-winning development was the inspiration of healthcare organization, Centerstone, alongside the Richmond Housing Authority. The U.S. Department of Housing and Urban Development (HUD) HOME program provided most of the funding for the 57,000-square-foot building. However, the funding came with strict guidelines related to energy efficiency and environmental sustainability. Because stringent federal requirements were top-of-mind, the development’s design team quickly thought of Insulspan. Hinde says it doesn’t matter what wall or roof thickness a building’s design requires. Why? Because SIP walls and roof assemblies result in buildings with higher overall thermal resistance and lower air leakage. Therefore, energy usage is reduced and energy savings increase. This high energy efficiency is because Insulspan SIPs have a continuous core of expanded polystyrene (EPS) insulation. They also have less framing than stick framed walls with cavity insulation. Consequently, SIPs reduce the effect of thermal bridging through studs. Air leakage rates for buildings using Insulspan SIPs are typically much lower than buildings built with stick framing. This too offers an additional source of energy saving potential. Curious about how much energy can be saved? For the Redwood Terrace development, the projected savings to building owner, Centerstone, was $44,000 annually. Redwood Terrace received the Wayne County Area Chamber of Commerce Community Improvement Award. This award was due to the project’s significant improvement on the quality of life in the community. “Combining smart design, Insulspan SIPs, and energy-efficient HVAC systems, led ARCHitecture to tremendous savings,” said Hinde. To learn more about the Model Energy Code, visit the Office of Energy Efficiency & Renewable Energy’s (EERE) website. Learn more about commercial buildings and improved energy performance from the New Buildings Institute (NBI) website, here. 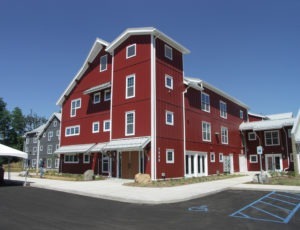 Finally, read about more multi-family/multi-use residential projects built with Insulspan SIPs here.